Cool you all! I’ll let it sink in another day or two, then I’ll make an email thread with you all and a couple others that replied on Facebook and we can make a plan with logistics, book titles and stuff. 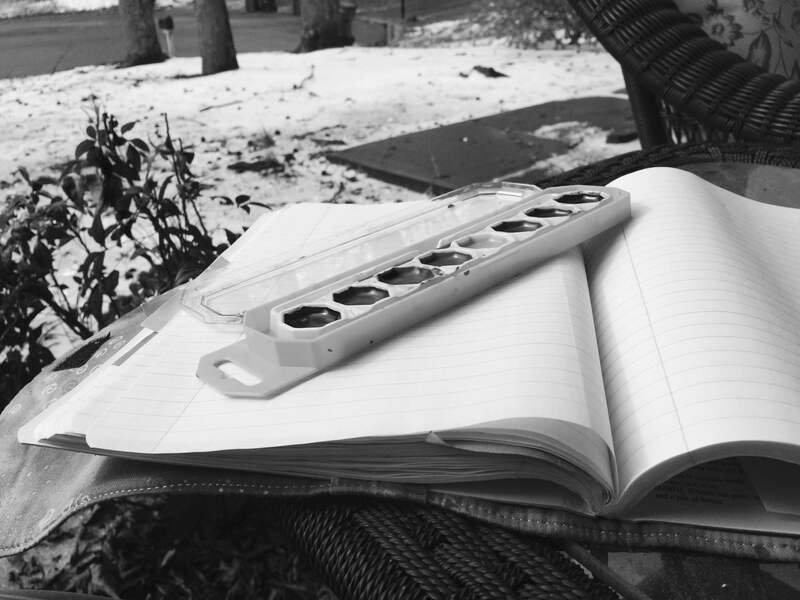 The icy days at home this week put me a mood to write, ponder and get jazzed about new ideas and connections. 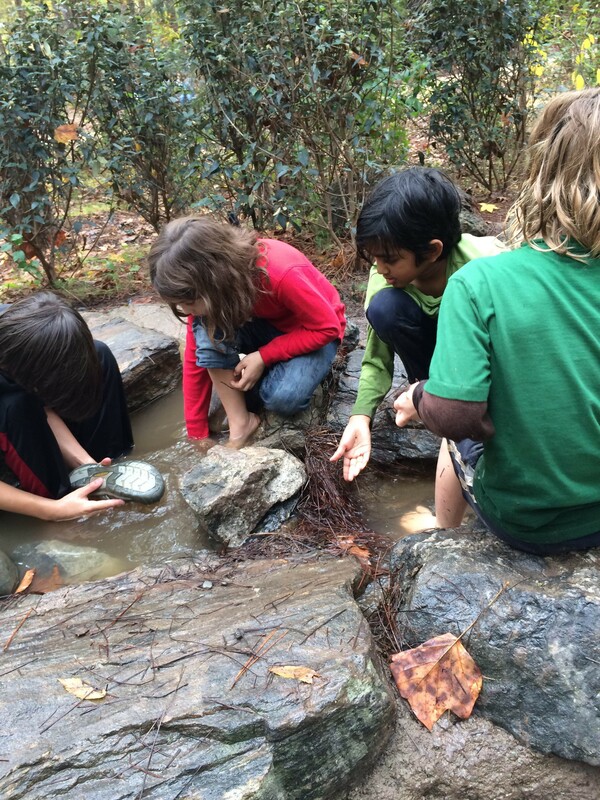 I had the opportunity one day to email a bit with another Charlotte mama and blogger who just got to visit Cedarsong Nature School in Washington state, the quintessential Forest Kindergarten in the US. 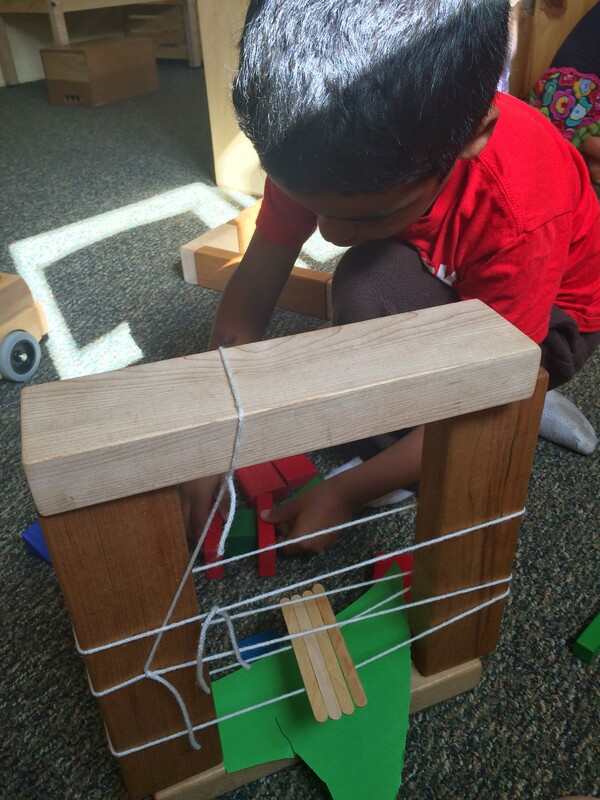 We both have an interest in nature based play/learning/being, and with just a tiny bit of connection, I got totally excited about creating more community around this thinking by gathering some others to read and play with me. 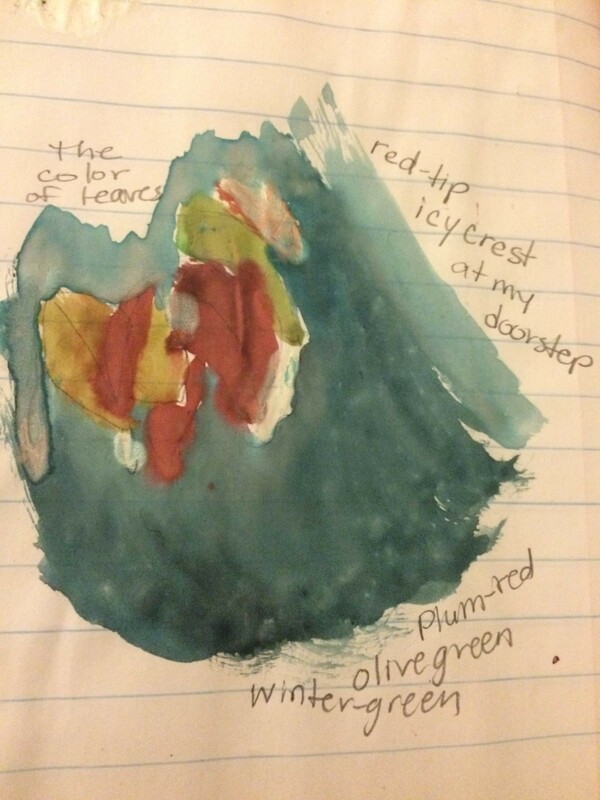 Since the roads were covered in ice and Amazon will take a few days to deliver the used copies of Coyote’s Guide to Connecting with Nature, and Forest Kindergartens the Cedarsong Way that I bought, I eventually ended up on my front porch with my daybook and some of Luke’s watercolors. For the past few weeks I have been reading a beautiful book of nature journaling, Drawn to Nature, by Claire Walker Leslie and I realized I have a great desire to do my own nature journaling. I have kept a journal or daybook (a little messier, a little more well rounded, a little more like a writer’s notebook than an everyday journal) for many years and have spent a lot of time working with kids and other teachers on thinking about how this tool can support our writing lives. 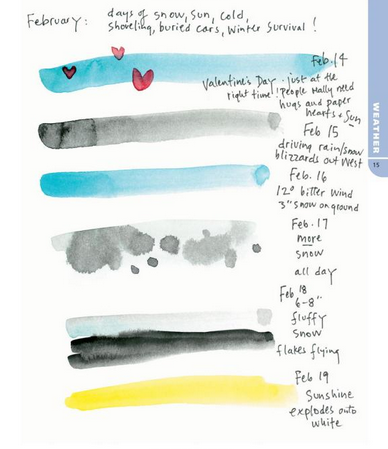 Seeing the pages with snippits of beautiful nature watercolors surrounded by scrawled notes, observations and bits of poetry in Claire’s book really resonates with me. These are little pieces she has found in the moment and saved through her words and visuals. I bought the book because I thought it might be an inspiration to invite the kids to do some nature journaling… and now I am even more eager to try this for out myself! This is a page from Clare’s book, Drawn to Nature. You’ve really got to flip through this to see the amazing ways she visualizes. So I decided to jump in and see what it would be like. Mostly I just played around with getting the colors to resemble the colors of the leaves on a “red tip” bush in my front yard, figuring out the ice that was beautifully clinging is like 4.0 to my .06, but it felt really good to try. Exploring this tiny bit of nature journaling myself reminding me of an aspect of school I am finding so joyful. I am finding the space while being with the kids to take up things that I have long wanted to be part of or more part of my life- being outside, doing handwork (making things with my hands), and visual arts. I am becoming more and more cognizant of how my home and school lives intertwine. So while a snow day or other day away from school gives me the time to linger over my reflections by myself or with other adults long enough to let things slowly collide together into inspiration, I don’t need days off school to work on most of my interests and passions- I get to do these things at school and the kids sometimes join or they just see an adult trying out something new or practicing at something to work on her craft. 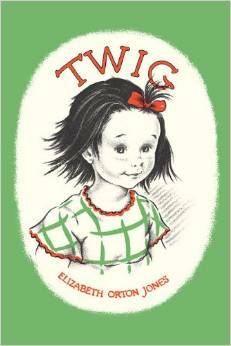 So my new-to-me books are on the way. 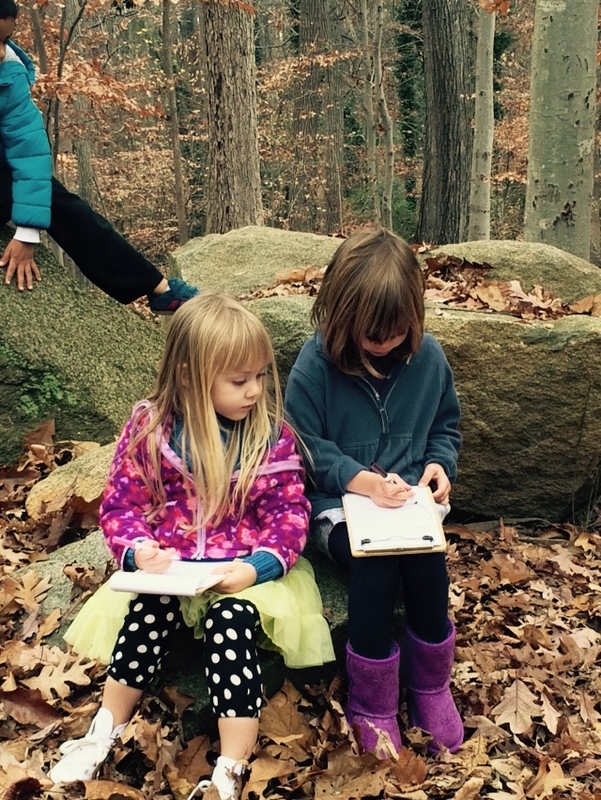 Wondering if any Mosaic, ALC or other folk want to read and talk some more about nature based playing/learning/being with me and/or maybe join along in trying my (or maybe for you extending your) hand at nature journaling. Who’s in? Lovely, Nancy! I’ve got our shared land image broadcasting to the universe daily, until then we’ll have our county full of lovely parks and shared ideas.